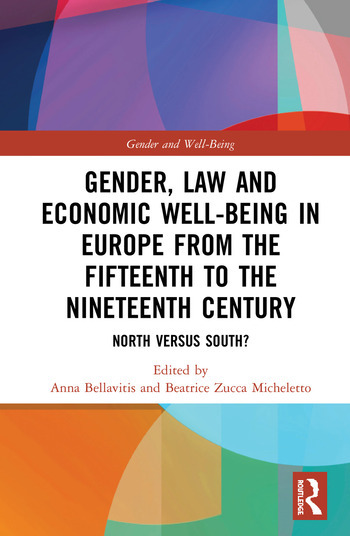 Gender, Law and Economic Well-Being in Europe from the Fifteenth to the Nineteenth Century: North versus South? This book offers a comparative perspective on Northern and Southern European laws and customs concerning women’s property and economic rights. By focusing on both Northern and Southern European societies, these studies analyse the consequences of different juridical frameworks and norms on the development of the economic roles of men and women. This volume is divided into three parts. The first, Laws, presents general outlines related to some European regions; the second, Family strategies or marital economies?, questions the potential conflict between the economic interests of the married couple and those of the lineage within the nobility; finally, the third part of the book, Inside the urban economy, focuses on economic and work activities of middle and lower classes in the urban environment. The assorted and rich panorama offered by the history of the legislation on women’s economic rights shows that similarities and differences run through Europe in such a way that the North/South model looks very stereotyped. While this approach calls into question classical geographical and cultural maps and well-established chronologies, it encourages a reconsideration of European history according to a cross-boundaries perspective. Family strategies or marital economies? 8 Women of high- and medium-ranking officers in the Île-de-France between the seventeenth and eighteenth centuries: What economic agency? Anna Bellavitis is Professor of Early Modern History at the University of Rouen-Normandy, Director of the Groupe de Recherche d’Histoire (GRHis EA3831) and Senior Member of the Institut Universitaire de France. Beatrice Zucca Micheletto is Marie Sklodowska-Curie Fellow at the Cambridge Group for the History of Population and Social Structure, University of Cambridge, and associated researcher at the Groupe de Recherche d’Histoire, University of Rouen-Normandy.